So this recipe almost didn’t happen. 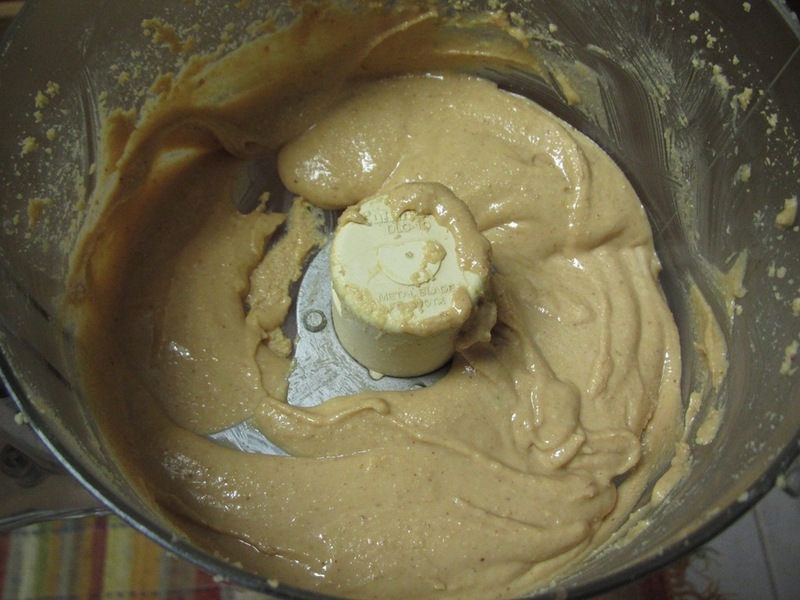 Which would have been so sad because how can I end Peanut Butter Month without a peanut butter recipe?! I found the perfect 4th recipe for a Vegetarian Peanut Soup. But after looking through our meal plans for the week, I just didn’t think we needed another meal. Not that I won’t be making this recipe soon, it just will have to wait until next month. I knew that I didn’t want to make another super sweet dessert. Since Thanksgiving, we’ve had more than enough sweets in the house, and I knew we didn’t need another one. In the spirit of healthy holiday eating, I was inspired by this recipe on Nutrionella to make a peanut butter themed energy bar (with homemade peanut butter of course). I threw the ingredients into the food processor, pressed start, and an eruption occurred. The mixture was way to thick and my food processor started dancing like it was standing on coals. Checking back in with the recipe, it appeared that I used 2x as many nuts as I was supposed to. I made a few attempts to make things work, but my processor started to sound like ‘the little engine that could…so sad. Then, I discovered that I had used dates with pits. Yikes! Note to self (and fellow bloggers)…never put dates with pits in your food processor. Nothing good will come of it! I pulled everything out and started looking through the mush…there were definitely pits. What to do??? The answer seemed obvious. Start over! When you don’t have enough dates left to remake bars you already messed up once, prunes sub in just fine! I de-pitted my dates, threw in some prunes and ran the food processor. Once they formed into a big ball, I added the correct amount of nuts. Much better! Everything looked fantastic, so I added in a few more peanuts and dried cranberries to drive home that Peanut Butter and Jelly taste. The last step was easy as I pushed the bars into the pan and sprinkled in a few more cherries. And of course had a taste test…it was pure PB&J love! They bars taste just like everyone’s favorite sandwich! I de-pitted the original dough, threw it back into the food processor with some extra dried fruit, gave the processor a break by drizzling in some agave and then threw the ball of dough into the bottom of a round tuperware and put it in the fridge before starting dinner. When the BOY came home, he devoured dinner and went in search of dessert. He asked what the bars were and when I said Peanut Butter and Jelly bars, he dug right in! Surprisingly, he liked them! Why is this a surprise, because there is just healthy ingredients like dried fruits and nuts which is not is usually snacking MO. ‘But there’s Jelly’ he said to me after his first bite. Not quite BOY, but I won’t tell him if you don’t! What is the best PB recipe you made/ate this month? Why the foggy brain and messy kitchen? I blame my relaxing massage earlier in the day. BTW, if you live in my area, I highly recommend this place. I had one of the best massages of my life! My ITband has never gotten such TLC and I felt so amazing that I slept for nearly 11 hours last night. I am so refreshed and ready to head into the fun holiday season. Place dates in food processor and blend until combined. A big ball will start to form. Add in the peanut butter, nuts, and oats. Blend well. Add in 1/2 cup cherries and peanuts and pulse until coarsely chopped. Place dough into a baking pan covered with parchment paper and press evenly into the bottom of the pan using your hands. Sprinkle with the last 1/4 cup of cherries and place in fridge for about 2 hours. Note: You can also shape the dough into balls or cut them with a cookie cutter. These freeze well! I’m not sure that I could make it without nuts. I do try to limit peanuts and eat more almonds but not this month…ha ha! Thai Peanut Noodles sound excellent!!! Glad to know I’m not the only one…ha ha! I was totally surprised that they both turned out so good and that the BOY has been snacking on them! I absolutely love peanut butter-I need to try these-how many does the recipe make? I really have to plug it into the recipe builder and get the points plus. Thanks for all the recipes! Me too! I would have cried…seriously, like real tears. But lesson learned and I can’t wait to try more fun flavors. I love that coffee LARABAR and I bet it would make an awesome healthy snack. Hope you enjoy them. Thanks for stopping by! Delicious looking recipe! I think I’ll have to bookmark this for when we’re into training again. I don’t think I made any peanut recipes this month 😦 But, i have stuck with my trusty PB&J every morning for breakfast! Yum! That is going to be my lunch tomorrow because we are totally out of food : ) These will be great for training! I love how having a boy around is a great means to cleaning out a fridge / left overs! These bars look awesome! A food processor is on my christmas wish list! You will LOVE it! I use mine all of the time for EVERYTHING. Definitely get a big one (at least 7 cups) because you will need it for all of your fun recipes! I’d send you one for free!!! These would make great fuel for long training days on the bike. Can’t wait to try ’em! FYI they are 4 points plus each-not bad for all that power driving nutrition but not to be taken lightly unless using for a long workout (pre-, post- or during). Could also work for marathon shopping where you really don’t want to stop and eat but could add a nonfat latte and keep going! Thank you! Thank you! I wasn’t sure so it’s good to know! I will say that I shared them at work today and everyone agreed they make the perfect 4pm pick me up! I made the bars but I only have a mini processor. I even halved the recipe – the end result was amazing -my daughter had 2 yesterday and took some back to school for the all nighters before finals next week. So glad that you were able to make them in the mini! They will be the perfect pre finals snack. Thanks for the comment!